A free event as part of Tate Modern’s Street Art exhibition curated and promoted by young people, encourages youth across South London to work with New York artists Graffiti Reaserch Lab to mark the building with light projections. ‘Tate Studio’ is a free event with a vibrant line up of street artists, bands and DJs who will take over the Level 2 Café and other areas of the gallery encouraging young people to experiment with different forms of street art such as projection, drawing and sticker-layering on life sized body cut outs. 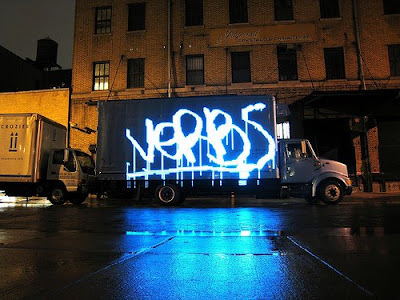 Young people have invited experimental and award-winning New York artists Graffiti Research Lab, who will reface Tate Modern with a spectacle of graffiti light projections. Young people will be able to create their own digital street art instantly scaled up and projected onto London’s largest modern art gallery.